A little over a month ago I was told about a young boy named Dylan from Louisiana who is battling cancer and asked if I would consider dedicating one of my Jewelry for Charity Pieces to help him and his family. I always like to make my charity pieces special by making them meaningful so I asked to learn a bit about Dylan. Well, his favorite color is green. He's interested in the metaphysical/healing properties of gemstones and he loves dragons. Wow...what a challenge for me! There's an army of people praying for Dylan and doing things to help him and they're referred to as Dylan's Dragon Warriors. I've now joined this group and named the jewelry after it. 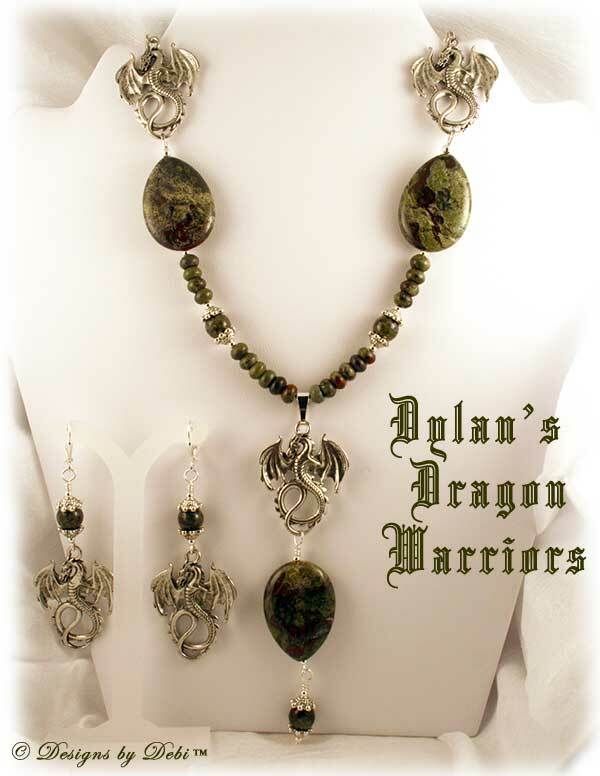 I wanted to include all of the things he mentioned so I set off on a hunt for dragons, gemstones, green components and gave a shout out to my creative muse to help me pull something together! After quite a bit of searching I found the perfect winged dragons. 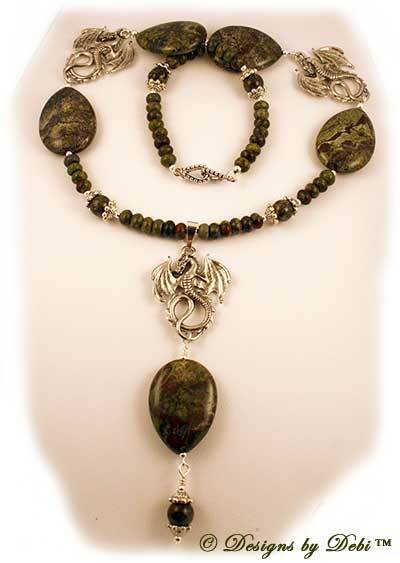 Next I decided to research gemstones and made an interesting discovery... there's actually a stone called dragon blood jasper! And it would be perfect... it increases courage and strength; keeps your spirits up; helps backaches; aids in recovering from illness and is a talisman for healing and health...and it's green! The stone is mostly green with varying amounts of red. Local legend in Australia where it's found says that the stone is the remains of deceased ancient dragons ~ the green being the skin and the red blood. I looked around to see if I could get some and what shapes were available then I started sketching a design. To go with the stones and theme, I selected a nicely detailed TierraCast hook and eye clasp and found perfect little pewter bead caps that made me think of dragon feet. It is totally different than anything I've ever made, but I think it all came together perfectly. Green is actually my least favorite color. Other than TierraCast, I've never used pewter components. And dragons, well, that's a first too! I'm delighted to admit that Dylan pushed me waaaaaaay outside my comfort zone on this one and I hope he likes the results! Dylan is 11 years old. He was diagnosed with an inoperable anaplastic astrocytoma in his spine. The tumor had been shrinking, but unfortunately last month they received the devastating news that Dylan's cancer had spread. There are now multiple tumors along his spine and 3 in his brain. His last hope would be a clinical trial of some kind. Well, thankfully he was just accepted into a clinical trial at St. Jude Children's Research Hospital. He's flying there with his Mom today and will be there at least a month. As you can imagine the medical bills are piling up fast. This charity set is one of the ways I'm trying to help. The necklace measures 20 inches long and the center adornment hangs down 4 inches. 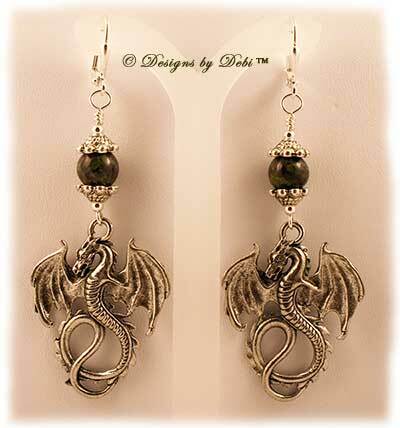 The earrings are 2 3/4 inches long. Note: If you are looking for a traditional style sterling silver and crystal Awareness Bracelets, you can find them on the Awareness Bracelets page. They are available in all colors.